SAN LUIS OBISPO — Jim and Michelle Marderosian, longtime supporters of Cal Poly’s College of Agriculture, Food and Environmental Sciences and key leaders in the citrus industry, have pledged $1.5 million to the college’s new J.G. Boswell Agricultural Technology Center. The gift will fund a new plant pathology lab that will be used to diagnose and explore plant diseases and disease control strategies. Jim Marderosian founded Bee Sweet Citrus in 1987 in Fowler, California, as an independent packer and shipper of California oranges. In the last 30 years, the company has expanded and grown to be a leader in the industry and now ships citrus products including navel and Valencia oranges, lemons, grapefruit and mandarins throughout the United States and overseas through export. The Marderosians both attended Cal Poly in the 1970s; Jim Marderosian attended Cal Poly’s Orfalea College of Business and Michelle Marderosian studied social sciences and business. They hope the gift will inspire others to invest in Cal Poly’s renowned Learn by Doing education. The Applied Sciences Innovation Labs within the J.G. Boswell Agricultural Technology Center, expected to be complete in 2021, will feature 11 labs, each dedicated to an important emerging issue in agriculture, nutrition and the food industry. The Marderosians have a daughter and three sons: Chelsey, Thomas, Marcus and Steven. The two youngest sons are enrolled at Cal Poly studying agricultural systems management. Their oldest son, Thomas, graduated from Cal Poly in 2013 and now works for the family business running the technical department. Chelsey, a CPA, also works for the family businesses. 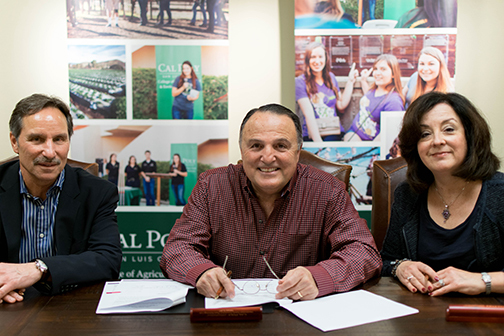 Cal Poly’s College of Agriculture, Food and Environmental Sciences Dean Andrew Thulin, left, with Jim and Michelle Marderosian as they sign the gift agreement pledging $1.5 million to the college’s new J.G. Boswell Agricultural Technology Center. Centrally located in the heart of campus and at the intersection of Via Carta and North Poly Vue Drive, the J.G. Boswell Agricultural Technology Center and its Applied Sciences Innovation Labs will serve as the new focal point for the College of Agriculture, Food and Environmental Sciences, as well as a highly visible and tangible example of applied interdisciplinary research in action. Architecturally engaging and modern in design, the building will become a hub of activity on campus, where communities of students, faculty and industry can gather, share and work together on the most challenging — and most promising — issues facing the agriculture and food industries. The 75,567-square-foot J.G. Boswell Agricultural Technology Center is expected to be complete in 2021. Cal Poly is a nationally ranked, comprehensive polytechnic university. The university’s College of Agriculture, Food and Environmental Sciences is comprised of expert faculty members who take pride in their ability to transform academically motivated students into innovative professionals ready to solve the complex challenges associated with feeding the world in sustainable ways. Students have access to state-of-the-art laboratories, including ranch land, orchards, vineyards and forests, all of which provide the basis for Cal Poly’s Learn by Doing methodology. It is the fifth-largest college of agriculture in the country, with about 4,000 undergraduate students.